But five days later, we began a miscarriage. Again, taking from C.S. Lewis, we were “stunned by grief.” At future times, I will chronicle some of the grief associated with miscarriage to hopefully serve the vast numbers of moms and dads experiencing them, but for now, I want to share about an important day in our family’s life. Since that dreadful December 4 of losing a child, we have sought to “redeem” that day. In our family, we call it, “Joy Sees Jesus!” day! On this day, we reflect on what it must be like to see Jesus like Joy does, and we find ways to serve and help others in her honor. On December 4 of this year, each sister or brother of Joy chose a warm blanket to give a newborn and a mom who chose life in Joy’s honor. 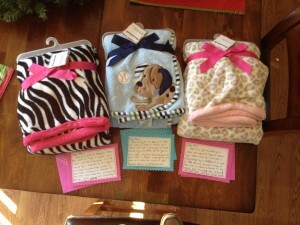 We chose three blankets – one for Joeli, one for Eden and one for Joy’s new sister who still lives in China! We made our way to Choices – a group in Chattanooga that seeks to serve women who are making choices about their unborn babies. At the back of their building, they have a Remembrance Garden to honor miscarried children. We have a brick with Joy’s name on it in the Garden. He said, “Oh yes! I am SOOOOO excited to see Joy right now in Heaven! We get to go to heaven!” He rubbed his hands together, looking ready to burst due to his internal emotion and passion and “realization” that I was taking them on a quick trip to heaven! J’s question, “Can we go see Joy’s place?” immediately took him to the delight and pleasure of visiting her where she is (heaven) and if we visited her place, surely we would see her! E was beside himself with excitement. I hated to burst his bubble, I helped Eden understand we would simply see Joy’s brick. Looking quite disappointed, he followed us to the Remembrance Garden. I felt a bit let down too. Heaven and Joy sounded way more amazing than a brick to simply remember her in a garden with leaves all over the ground. I am not too certain of the answer to that question, but I DO know that Jesus saw. We asked Jesus to send Joy a message for us. I believe it was delivered, because I have a deep conviction that Jesus is good and walks through our human brokenness with intimacy. Joy is a huge part of our lives. Not in a way like my other children, but actually in a deep place of trust and reflection. My child HAS SEEN Jesus! My daughter hears the sounds and sees the colors of heaven. I have a feeling when my end comes near, I will have that expectant look on my face knowing I am about to hold my Joy for the first time. And for that I can celebrate “Joy Sees Jesus” day every December 4 with a heart that deeply misses, but with a hope that fully expects and believes in Jesus who said, “I am the resurrection and the Life. 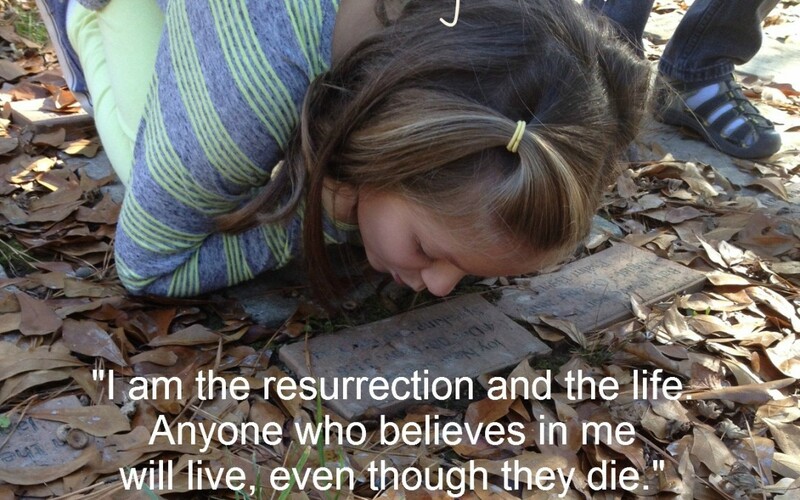 Anyone who believes in me will live, even though they die” (John 11:26). Jesus is that good. You may have experienced the loss of someone too. I know that the journey through grief is huge and is at times so raw that it burns. At Christmas, sometimes that grief seems unbearable. Know that today I have prayed for you –that in the midst of your intense and deep longing, you will also experience indescribable hope and joy. Who are you excited to see in Heaven someday? Have you ever celebrated their “She/he sees Jesus!” day? I have three grandchildren safe in the arms of Jesus. I’m aware of the joy of knowing they are safe and well. I have other grandchildren who are, as my grandmother used to say, hostages to fate. I pray for them incessantly. Bravo and congratulations on the progress for your new daughter. I can hardly wait til you have her home. Judith, I know what you mean. I have no fears for Joy at all. She cannot be hurt by the evil of this world. I also find myself pleading with God for protection of mine on earth! And I too can’t wait to have my youngest in my home – hopefully only about 3-4 more months of waiting! What a precious way to remember Joy and keep her alive in the hearts of J & E. Thank you for sharing. Can’t wait to see your new little one here in the states with you! Thanks Vonda! J said the other day, “Mommy, you have four kids but only two are with you. One lives with Jesus and one lives in China.” I long for each of them – but Lord willing we will have our Chinese daughter with us soon! Leslie, I so appreciate this post! I have 4 babies waiting for me in heaven! Wow Judy! Thanks for sharing. Four – wow! Our babies know each other! I so enjoyed meeting you, Chad and Phoebe tonight. I felt so blessed and privileged. I have 6 in heaven, Joshua Caleb, Olivia Grace, Dustin Allen, Sarah Hope, Jonathan Michael, Joseph Alexander. I often think of how much they are going to know when I get there. They have been following Jesus around, and so many others listening to teachings and stories. Simply marvelous. Celebrating the she/he sees Jesus day is a pretty fabulous idea. I have 3 living children – Faith Elizabeth, Amanda Joy and James Michael. And so far I have 2 godly sons in law, and 2 grandchildren!